Brigadier general (Brig. Gen.) or Brigade general is a senior rank in the armed forces. It is the lowest ranking general officer in some countries, usually sitting between the ranks of colonel and major general. When appointed to a field command, a brigadier general is typically in command of a brigade consisting of around 4,000 troops (four battalions). In some countries a brigadier general is informally designated as a one-star general (OF-6). In some countries, this rank is given the name of brigadier, which is usually equivalent to brigadier general in the armies of nations that use the rank, although the rank is not regarded as a general officer. The rank can be traced back to the militaries of Europe where a brigadier general, or simply a brigadier, would command a brigade in the field. The rank name général de brigade, (which translates as "brigade general"), was first used in the French revolutionary armies. Some armies, such as Taiwan and Japan, use major general as the equivalent of brigadier general. Some of these armies then use the rank of colonel general to make four general-officer ranks. Mexico uses the ranks of both General brigadier and General de brigada. Note that in many Commonwealth countries, the equivalent air force rank is Air Commodore (and in the Netherlands, it is simply Commodore). The rank of brigadier general (with some local variations) is used in the Argentine Air Force. Unlike other armed forces of the World, the rank of brigadier general is actually the highest rank in the Air Force. This is due to the use of the rank of brigadier and its derivatives to designate all general officers in the Air Force: brigadier (lowest general officer); brigadier-major (middle); and brigadier-general (highest). The rank of brigadier general is reserved for the Chief General Staff of the Air Force, as well as the Chief of the Joint General Staff if he should be an Air Force officer. The Argentine Army does not use the rank of brigadier-general, instead using brigade general ( Spanish: General de brigada ) which in turn is the lowest general officer before Divisional General ( Spanish: General de Division ) and Lieutenant General ( Spanish: Teniente General ). In the Australian Imperial Force during World War I, the rank of brigadier general was always temporary and held only while the officer was posted to a particular task, typically the command of a brigade. When posted elsewhere, the rank would be relinquished and the former rank resumed. This policy prevented an accumulation of high-ranking general officers brought about by the relatively high turnover of brigade commanders. Brigadier general was also used as an honorary rank on retirement. The rank insignia was like that of the current major general, but without the star/pip[note 2] - example. As in the United Kingdom, the rank was later replaced by brigadier. Hence, prior to 1922, a "brigadier general" was a "general officer"; subsequently, brigadiers were not "generals"; this is shown by the rank insignia being like that of a colonel, but with an extra (third) star/pip[note 2] - example. Prior to 2001, the Bangladesh Army rank was known as brigadier, in conformity with the rank structure of the Commonwealth Nations. In 2001 the Bangladesh Army introduced the rank of brigadier general, however "the grade stayed equivalent to brigadier", and although classified as a "one-star rank", a brigadier general is not considered to be a general officer – the lowest ranking general officer is Major General. Brigadier general is equivalent to commodore of the Bangladesh Navy and air commodore of the Bangladesh Air Force. It is still more popularly called brigadier. The Belgian Army uses the rank of général de brigade (French) and brigadegeneraal (Dutch) (Brigade General). However, in this small military there are no permanent promotions to this rank, and it is only awarded as a temporary promotion to a full colonel who assumes a post requiring the rank, notably in an international context (e.g. as Military Attaché in a major embassy). The rank of brigadier general is known in Burma as bo hmu gyoke and is often the deputy commander of one of Burma's Regional Military Commands, commander of the light infantry division (LID) or Military Operation Commands. In civil service, a brigadier general often holds the office of deputy minister or director general of certain ministries. In the Canadian Forces, the rank of brigadier-general (BGen) (brigadier-général or bgén in French) is a rank for members who wear army or air force uniform, equal to a commodore for those in navy uniform. A brigadier-general is the lowest rank of general officer. A brigadier-general is senior to a colonel or naval captain, and junior to a major-general or rear admiral. The rank title brigadier-general is still used notwithstanding that brigades in the army are now commanded by colonels. Until the late 1990s brigades were commanded by brigadier-generals. In the air force context, brigadier-generals used to command air force groups until these bodies were abolished in the late 1990s. The rank insignia for a brigadier-general on air force uniforms is a single wide braid on the cuff, as well as a single silver maple leaf beneath crossed sabre and baton, all surmounted by St. Edward's Crown, worn on the shoulder straps of the service dress jacket, and on slip-ons on other uniforms. The rank insignia on army uniforms is a gold maple leaf beneath crossed sword and baton, all surmounted by St. Edward's Crown, on the shoulder straps. On the visor of the service cap are two rows of gold oak leaves; the air force wedge cap features silver braid on the edges of the ear flaps. The cap insignia for a general officer is a modified version of the Canadian Forces insignia. Army brigadier-generals wear gorget patches on the collar of the service uniform tunic. Brigadier-generals are initially addressed verbally as "General" and name; thereafter by subordinates as "Sir" or "Ma'am" in English or mon général in French. They are normally entitled to staff cars. Note: Until unification in 1968 of the Royal Canadian Air Force, Canadian Army, and the Royal Canadian Navy, rank structure and insignia followed the British pattern. This system of rank insignia was reinstated in 2014. In army usage, the term "brigadier" was used to denote what is now known as a brigadier-general while the air force used the rank of air commodore. Chinese rank of (Da-Xiao 大校) or Senior Colonel is a direct equivalent of a brigadier. It ranks above colonel (Shang-Xiao 上校) and below major general (Shao-Jiang 少将). A brigadier is commonly in command of a division (Shi 师) or a brigade (Lv 旅). Divisional commanders are seldom general officers. The rank of brigadier general is the first general officer rank in the Fuerzas Militares, and the National Police. Denmark, a NATO member, has for many years been following NATO standards and adapting its rank system to closely relate. As in the armies of most other NATO nations, brigadier general is the lowest of the general ranks, usually a brigade commander. In the Estonian military, the rank is called Brigaadikindral. France uses the rank of "brigade general" (général de brigade). It formerly used the historic rank, until 1793, of brigadier des armées ("brigadier of the armies"). The rank contrasts with the French sub-officer rank of brigadier. As with all French general officers, a French brigade general is titled "general" without any implication that he is an army general; for instance General Charles de Gaulle never rose higher than brigade general. Until 1793, a rank of brigadier des armées ("brigadier of the armies") existed in the French Army, which could be described as a senior colonel or junior brigade commander. The normal brigade command rank was field marshal (maréchal de camp) (which elsewhere is a more senior rank). A "brigadier of the armies" wore one-star and a "field marshal" wore two stars. During the French Revolution, the revolutionaries' drive to rationalise the state led to a change in the system of ranks. The rank of "brigadier of the armies" was abolished and the normal brigade command rank, field marshal, was replaced by brigade general. The rank of brigade general inherited the two stars of the rank of field marshal, explaining the absence since 1793 of a French rank with only one star. Nowadays, a French général de brigade generally commands a brigade, which is the biggest permanent formation in the French army. The rank can also be awarded in an honorary fashion to retiring colonels. The insignias are two stars, worn on the shoulder are at the sleeve of the uniform, depending on the dress. Two different kepis are issued : the service kepi sports the two stars, while the formal kepi features a large band of oak leaves (the kepi of a division general has two smaller such bands). 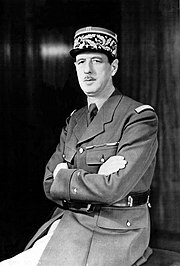 Charles de Gaulle held the rank of brigade general. He was given a temporary promotion to this rank in May 1940 as commander of the 4th Armoured Reserve Division (4e division cuirassée de réserve). However his authority as head of the Free French really came from being the only cabinet member outside occupied France, not from his military rank. As a reminder of his war position, he refused any further promotion. The equivalent modern German OF6-rank is Brigadegeneral. The concept of a brigadier general rank is relatively new, as prior to 1945 the lowest German general officer OF6-rank was Generalmajor, which was often considered equivalent to brigadier general in other armies. Brigadir jenderal (abbreviated as brigjen) is the fourth highest rank and the lowest general rank in the Indonesian National Police, the Indonesian National Armed Forces, and the Indonesian Marine Corps. The insignia is a gold star. The equivalent rank for brigadier general in the Iranian army and air force is called sar-tip. In Persian the word tip means brigade, and sar means head or commander. After 1987 the rank sar-tip dovom (second brigadier general) was introduced between sar-tip and sar-hang (colonel or literally head of regiment). There is no equivalent for sar-tip dovom in other countries. The rank above sar-tip is sar-lashgar. Lashgar means division so, sar-lashgar means divisional general (major general). The Iranian Revolutionary Guards also use this rank; the difference is in salutation. One refers an army or air force brigadier general as "amir sar-tip", while a revolutionary guard general is referred to as "sardar sar-tip". Major general is the highest Iranian military rank, and therefore brigadier general is considered to be second highest rank. It is equivalent to the rank of the commander of the air force, and commodore of the Navy. The country is divided into two areas for administrative and operational reasons, and in each area there is an infantry brigade. The two brigade group structure envisages distinct operational areas of responsibility for each of the brigades and is supported in its responsibilities by the Naval Service and Air Corps. Each of the brigade formations and the Air Corps is commanded by a brigadier general, while the Naval Service is commanded by a commodore. In the Italian Armed Forces the rank has different denominations. In the Army, the rank for combat arms officers is generale di brigata whilst for the logistics and technical corps is called brigadier generale. The rank is also present in the other armed forces, police corps and other services of Italy, with different denominations, and it is associated with the lowest level within the government top management. In the Jordanian military, the rank of brigadier general is known as amid (عميد), and it is higher than colonel (akeed عقيد) and lower than major general (liwa لواء). In Mexico, general brigadier wears the arms of Mexico with one star, and is the rank below general de brigada who wears as rank insignia the arms of Mexico with two stars. In Nepal, Brigadier General (Nepali: सहायक रथी) is the lowest ranking general officer sitting between Colonel (Nepali: महासेनानी) and Major General (Nepali: उप रथी), with one star. The rank was reintroduced in 1999. Before that, simply as brigadeiro, it existed from 1707 to 1864 and again from 1929 to 1947, not being considered a general rank. From 1947 to 1999, brigadeiro become the two-star general rank in the Portuguese Army. As two-star rank, it was substituted by the rank of major-general in 1999. In the Romanian Army the general de brigadă is the lowest rank of general officers, The equivalent in the Navy is contra-amiral and in the Air-Force general de flotilă aeriană. The rank of brigadier general is known in South Korea as junjang (Korean: 준장; hanja: 准將) and is a direct equivalent to the United States one-star rank, with very similar insignia. The military of North Korea does not technically maintain a brigadier general rank, but the rank of senior colonel (대좌, taejwa) which is above colonel (상좌, sangjwa) and below major general (소장, Sojang) is an effective equivalent. In the Spanish Army, Spanish Air Force, and Spanish Marine Infantry (Infantería de Marina, a branch of the Armada) general de brigada is the lowest rank of general officers. Its equivalent in the Navy (Armada) is contraalmirante. In the Swedish Army, Swedish Air Force and Swedish Amphibious Corps brigadgeneral is the lowest rank of general officers. Its equivalent in the Navy is flottiljamiral. Brigadier-general was formerly a rank or appointment in the British Army and Royal Marines, and briefly in the Royal Air Force. The appointment was abolished in both the Army and the Marines in 1921 and the equivalent rank today is simply Brigadier. In the United States Army, United States Air Force and United States Marine Corps, a brigadier general is a one-star general officer. It is equivalent to the rank of rear admiral (lower half) in the other uniformed services. ^ The général de brigade of the French Foreign Legion is the commander of the (entire) Legion. ^ a b Australian Army rank insignia for 2LT, LT, CAPT, LTCOL, COL, BRIG, MAJGEN and GEN use the Order of the Bath star, which is commonly referred to as a "pip".